I was very happy to find this Sync 3 unit to replace the MyTouch one in my car. This has way more features. I use it with Android Auto and it works seamlessly. Android Auto is a bit finicky, but that has nothing to do with this unit. It worked right away and was super easy to install. I did call tech support to get the Android Auto working, and they were SO friendly! I'm really impressed with 4D Tech! Some videos might show removing the center console to add the APIM but I believe those kits are either upgrading from MFT NON NAV to SYNC 3 WITH NAV. Or the SYNC 4" screen Without NAV to SYNC3 with NAV. 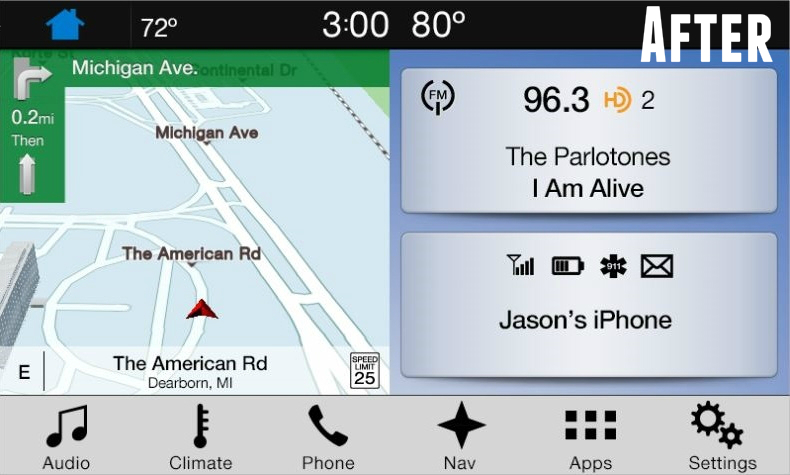 I was skeptical but if your vehicle has factory NAV you can replace with like model with NAV. Is it pricey yes but easy to remove and replace. Mine took about an hour to swap out. Note keep the foam that came with the new APIM That will come in handy to protect the new screen during bracket transfer. I of course kept the screen protective tape installed AND the foam. Instructions are spot on a couple of steps would be easier with photos but still workable. NOTE You lose the AUX input with SYNC 3 and that is not 4D. 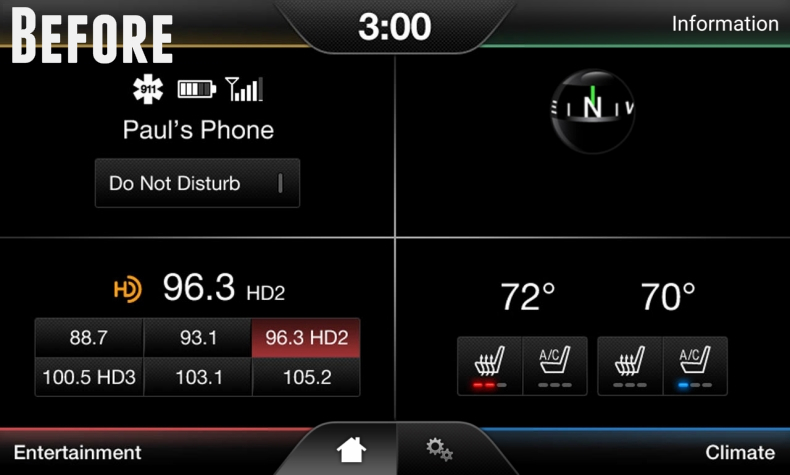 Even Ford showroom models with SYNC3 do not have AUX anymore. You still keep Dual USB 1 for Apple Car Play and one for music or charging. MFT NAV Users will also note that the SD card slot is removed. SYNC3 runs software updates over Wi-Fi primarily but can also be done with USB and download from the SYNC my ride site. Screen much more intuitive and easier to read and view. The light blue is a fairly easy color to the eyes for all modes of viewing but provides enough background contrast for easy viewing and understanding. I will report back in a few days to advise if the EXXON/MOBIL speed pass app works from the screen. This feature allows you to pay for fuel from the APP securely in the vehicle. Basically pull to the station and the GPS asks you what pump you want to authorize. Two immediate advantages come to mind 1. Reduce exposure to the elements during temperature extremes.....25-30 seconds less in the extreme weather is good...either 4F or 104F 2. Reduce exposure to credit card skimmers by not scanning credit card at the pump the credit card still needs to be authorized and linked to the E/M Account but by not actually scanning through pump less exposure to skimmers. The final advantage is less exposure outside the vehicle in lets say sketchy neighborhoods after dark or maybe even before. You still have to physically exit vehicle to pump the fuel but again less exposure. System easy to install took me about an hour and the wiring adapters are included if necessary. Bezel easy to remove and literally three tools needed t8 Torx, 7mm nut driver or socked with medium extension and the plastic trim removal tool. NOTE the USB/MEDIA HUB will remove a different tool, still trim removal but more of a 90 degree bend type. Instructions are easy to follow but wouldn't hurt to take a few photos before to assist with replacement. I missed the AM/FM and Satellite antenna connection since the connectors fell behind the dash. Brad from tech support replied immediately even after hours which I wasn't expecting and about 10 minutes later I was good to go.